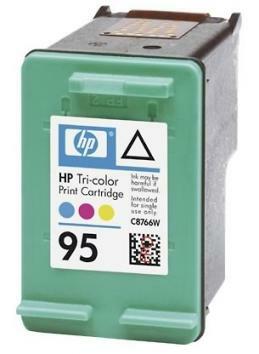 HP 95 Ink - C8766WN - For use in a HP Deskjet 460c, 460cb, 460wbt, 460wf, 5740, 5740xi, 5743, 5745, 5748, 5940, 5940xi, 6520, 6520xi, 6540, 6540dt, 6540xi, 6620, 6620xi, 6830v, 6840, 6840dt, 6840xi, 9800, 9800d. OfficeJet 6200, 6210 All-In-One, 6210v All-In-One, 6210xi All-In-One, 6310, 7210, 7210v, 7210xi, 7310 All-In-One, 7310xi AIO, 7408, 7410, 7410xi, OfficeJet H470 Mobile, H470b Mobile, H470wbt Mobile. PhotoSmart 2570, 2575, 2575v, 2575xi, 2600 Series, 2610, 2610v, 2610xi, 2710, 2710xi, 325, 325v, 325xi, 335, 335v, 335xi, 375, 375b, 375v, 385, 385v, 385xi, 422, 425, 428, 428v, 428xi, 475, 475v, 475xi, 8030, 8038, 8049, 8053, 8150, 8150v, 8150xi, 8450, 8450xi, 8750, C4140, C4150, C4180, D5060, D5065, D5069, D5145, D5155, D5160, Photosmart Pro B8350. PSC 1600 Series, Printer/Scanner/Copier 1610, 1610v, 1610xi, 2350, 2355, 2355v, 2355xi, PSC PhotoSmart 2610, 2710. Page Yield: 330 pages @ 5% coverage. Search terms: hp 95, hp 95 ink, c8766wn, hp 95 cartridge, hp c8766wn, hp photosmart 2575 ink, c8766w, c8766, hp 95 printer ink, hp 95 inkjet.